Why Use Tree Free Products? 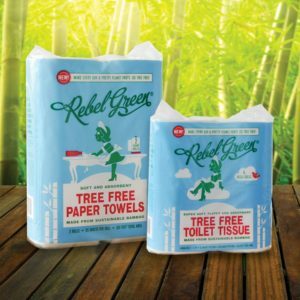 - Rebel Green: Eco-Friendly Products Responsibly Made in the U.S.A.
Why Use Tree Free Paper Products? Soft & Absorbent. Tree Free products are just as soft and durable as conventional paper products. Made from Bamboo. Bamboo is a more sustainable resource than trees. Some trees can actually take 30 years to grow and mature, while bamboo can grow 2.5 feet per day. In 3-4 months, bamboo is fully matured and ready to be harvested again. Save the Trees. Trees are habitats for various creatures, birds and insects. They also remove carbon dioxide from our air and replenish the oxygen we need to breathe. Panda Friendly. Pandas are adorable, and they eat bamboo! But don't fret. There are at least 1,500 species of bamboo, and the bamboo grass used in Rebel Green Tree Free products has been certified as a species that is not a food source for pandas. No Chlorine Bleach. Rebel Green does not use chlorine bleach during processing to achieve a white hue in the Tree Free paper products. The process is as natural as we can make it. In fact, most of the minimal amount of waste water we use is recycled for the next round of processing. Carbon Neutral. Rebel Green completely offsets the carbon generated from making, shipping and disposing of these bamboo products by partnering with The Paradigm Project, a social enterprise focused on combating poverty and global warming. With The Paradigm Project, we help fund clean cook stoves for poor women and their families in rural Kenya. Using a clean cook stove can reduce smoke, toxic emissions and fuel consumption, making the cooking process substantially healthier and safer for families and the environment. This reduction in carbon emissions completely offsets the carbon footprint of Rebel Green bamboo paper products. Bad habits are disposable. Good habits are renewable. Buy Tree Free!